I just visited Olivier Morosini for the first time yesterday, and I am so happy to have finally found a hair stylist who listens to what you are saying, pays attention to the kind of person you are and makes recommendations for YOUR hair. I am so glad I read all these reviews, as I would not have found out about Olivier otherwise. I have long, fine hair that takes forever to grow. When I lived in London I had my regular salon, but since moving away five years ago, I have had one disaster after another, to the point where I just gave up on cutting my hair. After having my hair chopped off into awful genericuts by various other 'professional salons' that nod and pretend to agree and then just do whatever the hell they want, I have been terrified to go to a salon again! Having just grown out my last bad cut from two and a half years ago, my hair was the length I wanted but looked unkempt. Olivier listened to what I told him, made some suggestions that would work for my hair, and then cut my hair whilst explaining to me what he was doing and why. Before my cut, Paige conditioned my hair ("It is too clean!" Olivier told me, hahaha!) and gave me a lovely head massage to the point that I think I fell asleep for a moment. I don't live near Manchester - I have to travel nearly three hours to get to Olivier's salon, but now I intend to visit every four to six weeks to keep my hair in shape. I am delighted and relieved to find a salon with staff that I can trust, and who seem to enjoy what they do and have the experience to do it beautifully. Olivier is lovely and friendly and puts you at ease straight away. I was also feeling very ill when I had my cut, and it was so nice to just be still for a little while and made to feel good about myself. I don't normally write reviews but seeing that I found out about Olivier Morosini on Qype I thought I just had to write one. 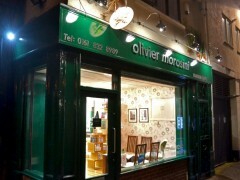 I recently visited Olivier's and had a wonderful time. I've often struggled to find a hairdressers where I felt as though they'd done me justice and where I felt comfortable but Olivier is a brilliant hairdresser, no nonsense knows what he is doing and is a lovely warm gentleman. The team are so friendly and very down to earth swell, well done for running such a lovely welcoming business. Ps the cups of tea and biscuits are also the nicest! I love this hairdressers! I've only been twice but both times I've gotten exactly what I asked for. The first experience was when I had bright red hair and I wanted to go brunette. I couldn't decide on a colour, then the day I went in I asked Kelley to make my hair the same colour as my boots! And she did! It was perfect. Both times have been a bit pricey but thats because I'm completely changing my hair colour. I always get compliments on my hair and here is the only place I trust to do it! 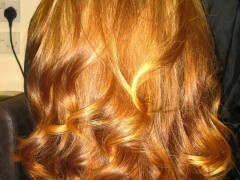 I was recommended this hairdresser by a friend and was refreshingly happy with the great service. Will be back. Got an appointment when I wanted it. Got very attentive service, genuine conversation and a great hair cut. Colour test done too for future colour with honest advice. Cut reasonably priced, hair product expensive but really works! I have been going to this salon for a couple of years now. They always do a brilliant job, particularly as my hair is really curly and I have had some truly awful hairdressing experiences over the years. I went in here after a hideous dodgy dye job at the hair cuttery went wrong - twice in the same appointment - and Kelley got my hair to go exactly the shade I originally wanted without any drama. I have been going to this place ever since. It is a really friendly place, the prices are reasonable and I never leave unhappy. All the hairdressers listen to what you tell them and give you cuts that will really suit you. If you are fed up of pretentious, over-priced and aloof salons where the hairdressers do what they like and are too busy styling their own hair in the mirror... I know I sound bitter, then Morosini's is the place for you. 8 months after having my baby I desperately need a 'pick me up' and went for a restyle and full highlights. I am so pleased with the cut and the colour is beautiful. All the staff were attentive, appeared happy to be at work and made my visit a refreshing experience. I've never felt inclined to write a review before so thats something!